This painting is called 'Les Licornes' (The Unicorns). 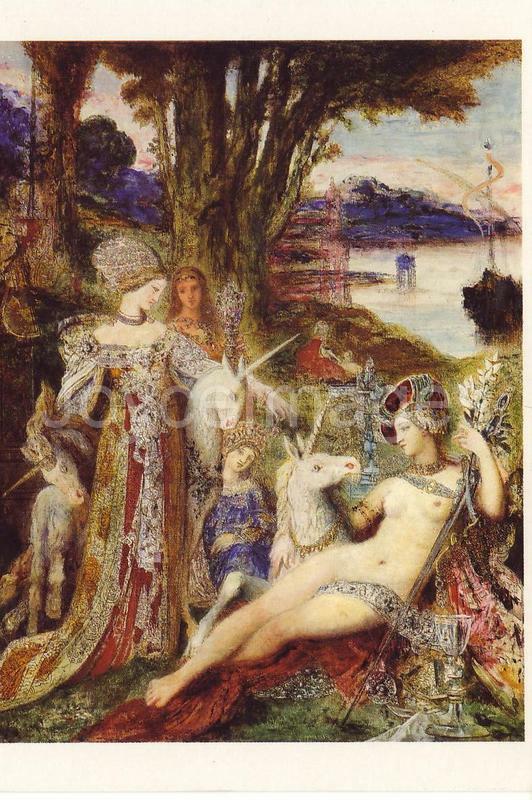 From Wikipedia: Gustave Moreau (1826 - 1898) was a French Symbolist painter. He was born and died in Paris. Moreau's main focus was the illustration of Christian and mythological figures. As a painter of literary ideas rather than visual images, his images appealed to the imagination of some Symbolist writers and artists, who saw him as the precursor to their movement. His first painting was a Pieta which is now located in the cathedral at AngoulÃªme. He showed 'A Scene from the Song of Songs' and 'Death of Darius' in the Salon of 1853. In 1853 he contributed 'Athenians with the Minotaur' and 'Moses putting off his Sandals within Sight of the Promised Land' to the Great Exhibition.